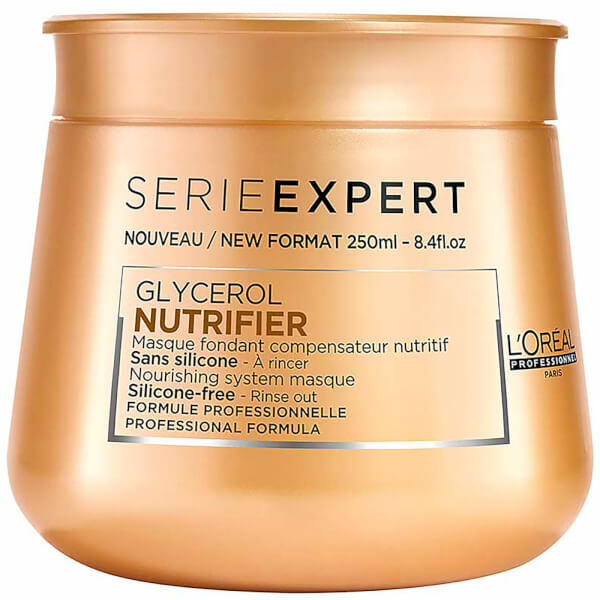 Catering specifically for dry hair, the L'Oréal Professionnel Serie Expert Nutrifier Masque delivers optimum moisture and hydration for a salon-worthy finish. Infused with a nourishing blend of Glycerol and Coconut Oil, the rinse-out mask revitalises damaged hair, whilst softening and enhancing shine from root to tip. Helps to prevent breakage and split ends to reveal smooth, manageable tresses with revived radiance. Apply evenly on shampooed and towel-dried hair. Leave on for 1 minute. Rinse thoroughly. 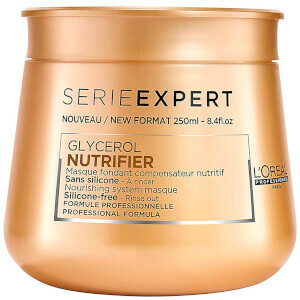 Aqua / Water, Cetearyl Alcohol, Glycine Soja Oil / Soybean Oil, Behentrimonium Chloride, Isopropyl Alcohol, Phenoxyethanol, Glycerin, Caprylyl Glycol, Benzoic Acid, Bht, Linalool, Hexyl Cinnamal, Limonene, Benzyl Salicylate, Arginine, Glutamic Acid, Benzyl Alcohol, Serine, Hydroxypropyltrimonium Hydrolyzed Wheat Protein, 2-Oleamido-1,3-Octadecanediol, Ci 19140 / Yellow 5, Ci 15985.